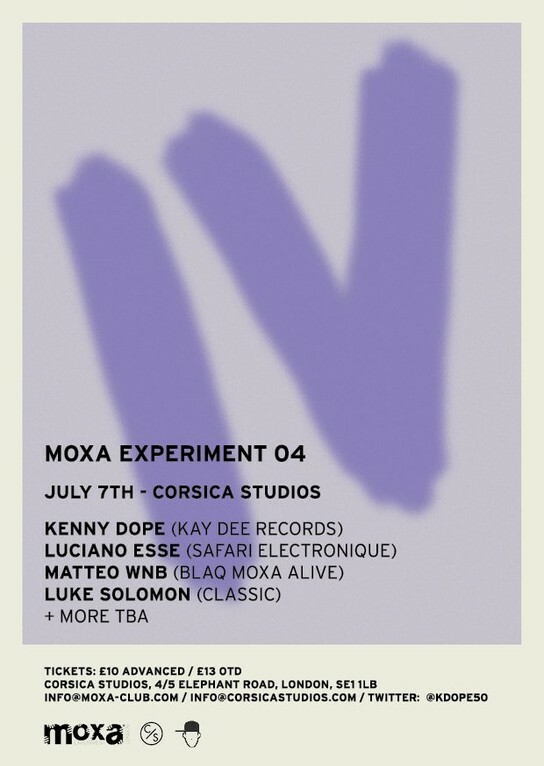 Moxa Experiment return to Corsica Studios on 7th July for the fourth edition of their London ‘Experiment’ events. This time they’re pulling in infamous house veteran Kenny Dope, one half of production outfit Masters At Work, bringing to the table his classic raw house sound. Joining the bill is Safari Electronique recording artist Luciano Esse, delivering powerful deep techno cuts throughout the night. Moxa’s very own Matteo WNB flies in from Italy to spin his extensive house and techno vinyl collection and resident Luke Solomon returns to present his eclectic outlook on music to all those yearning for hypnotizing house and techno. Moxa bring a versatile and conscientious nature with its approach to parties, with a balance of classic and contemporary artists.